Pretty short and very sweet story on this guy. I left work a little early Tuesday because my coworkers were talking about seeing bucks on their feet in the late morning. Lucky for me I did, turned out to be a great hunt. Packed up and headed to a small farm about 15 minutes from the house. Had to drive through some small showers but nothing major and temps were in the 40's I think. Suited up and on the walk back around 2ish I jumped a deer on the neighbors property, it was upwind so not the end of the world. Made my way to my lock-on and climbed up. I guess it took me 10 minutes or so to get settled in so I decided to hit a couple doe grunts. Within a few minutes I have a doe walking behind my tree and she hung out for five minutes or so before heading up the hill. I let a little time pass and toss a couple "buck chasing doe" grunts at em. Sure enough, a few minutes later a 4 point walks through at 15 yards and heads up the hill. I'm thinking,if it aint broke don't fix it. Threw another round of grunts and a couple bleats. Couple minutes go by and a 6 point walks in behind me and up the hill. Decided after another 10 minutes or so to try again and nothing this time......................maybe 30 minutes ticks off and down the hill in front of me I see a deer running strait to me. Whaaaaaat, it's another 4 point. He hung out in front of me eating locust tree seed pods like my kids munch popcorn. He gets his fill and moves off. Before I had time to settle back down something grabs my attention off my left shoulder. In the thicket I see the face of a deer. A second or two later the 8 point is out and moving down hill on my left 20 yards out. Dang man if he keeps going strait I'm out of luck. Bow arm is up following his ribs as he passed behind one branch, to one twig to one leaf and boom, on a dime he cuts right at a quick walk he's on a trail that brings him front and center to my opening and my shot! No time to think, no time to second guess, no time to feel the nerves, just, "maaaaa" to stop, pick a rib and off it went. The Wensel Woodsman teamed up with my Brackenbury put him down within seconds. He ran out about 60 yards or so and fell in a lower field just out of view. After an hour in the tree I headed down hill to find my boy. First I found the fletched half of my arrow and then 10 steps further, there he was. Thank you Lord, your gift is much appreciated. wow nice story, and excellent harvest, keep getting out there!!!! 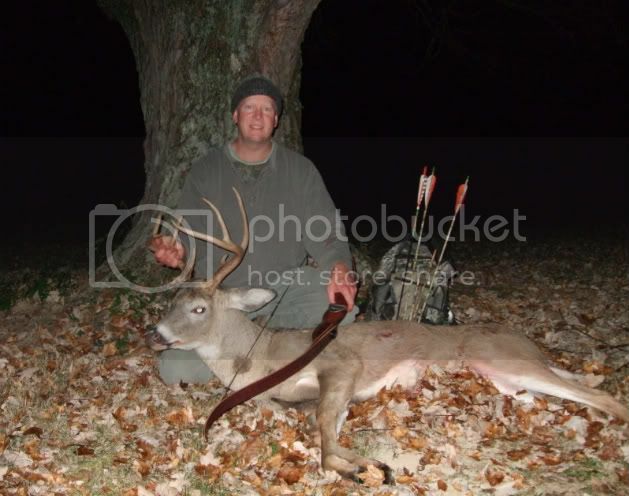 Congrats on a fine buck, Mike! I bet work was fun on Wednesday.